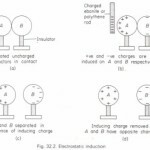 The difference between an insulator and a conductor is that, in an insulator, the electrons are firmly bound to their atoms and will not move of their own accord, whereas in a conductor the electrons are able to move freely from one atom to another. If an ebonite rod is held in the hand and rubbed with fur a charge of electrons is formed on its surface. These electrons cannot flow to earth through the hand, since they are unable to move through the insulating ebonite. When a brass rod is rubbed with fur it becomes charged with electrons in just the same way as the ebonite.However, the charge cannot be detected, since it is immediately conducted through the brass and the hand to earth. This may be prevented by mounting the brass rod on an insulating handle. The charge cannot now be conducted away, and its presence can be detected by bringing the rod near a gold-leaf electroscope. 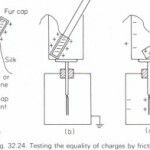 The charge can be tested and found to be negative by showing that there is an increase in divergence when the brass rod is brought near to the cap of a negatively charged electroscope.